After a large healthcare system closed its Independence, KS hospital, the local community faced a shortage of medical services. This closure was part of a broader trend threatening rural clinics across the Midwest. In 2016, for instance, 673 rural hospitals, constituting one third of all rural clinics, were at risk of closure, according to the National Rural Health Institute. For Independence, the search began for an outside hospital system that would provide services to the community. Labette Health, based in nearby Parsons, KS, understood the unique challenges of operating a healthcare clinic in a rural market. To achieve a sustainable proposal, Labette Health partnered with Health Facilities Group to reimagine what a ‘microhospital’ could be. This term usually refers to suburban or urban satellite clinics with limited surgery and inpatient capacity. These microhospitals reduce overcrowding at larger hospitals or serve as way stations from which to coordinate patient transfers to different facilities. HFG’s challenge was to further streamline an already lean model and demonstrate the feasibility of microhospitals in rural settings. 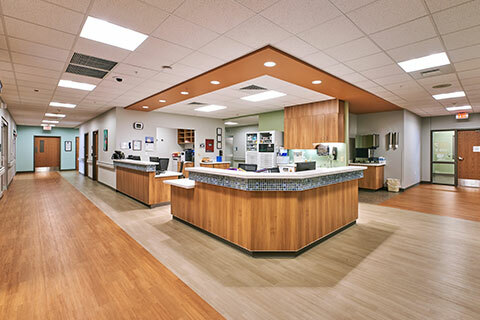 Using this Lean Design philosophy, HFG was able to incorporate an Emergency Department into the proposal. Labette Health was ultimately the only candidate hospital system able to promise the people of Independence an Emergency Department and the inclusion was instrumental to its successful contract with the city. Labette Health CEO Brian Williams has referred to Independence Healthcare Center as a “rural model for the future.” Through this project and others, HFG has developed extensive experience in harnessing population health data to produce sustainable market outcomes. By aligning services with market demand, HFG helped to ensure this facility’s long-term solvency. In Independence, KS, Health Facilities Group provided Labette Health with an innovative model designed to accommodate a rural market. The 17,600 SF Independence Healthcare Center is one of the first in Kansas to provide emergency and hospital level outpatient services in a freestanding building. Prioritizing the greatest needs of the community, this blueprint called for an emergency department, complete with a trauma room; three exam rooms; three rooms for observation/treatment, including a three-room observation Clinical Decision Unit; and imaging and laboratory services that contain a CT and X-ray. MRI services will also be provided via a mobile unit. The new facility includes a helipad for transport to other facilities for more critical emergencies and has been designed so that future expansion into a full hospital would require few modifications if inpatient, surgical, or other hospital departments are constructed adjacent to the emergency department. Outpatient services include a Patient-Centered Medical Home-style Rural Health Clinic for five providers with twelve exam rooms, one procedure room, and a lab. Additional features include two outpatient specialty clinics with four exam rooms and treatment areas and an oncology clinic.